Signed Impressionist Painting of Flowers from Brazil, "Flower Series IV"
By talented Brazilian artist Dallier, this composition is part of his 'Flower Series'. 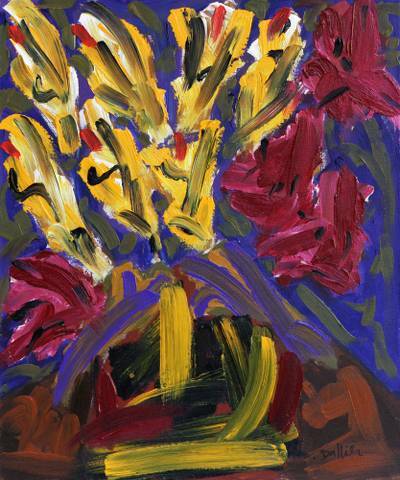 In a style that blends impressionism with expressionism, flowers in vibrant hues of yellow and burgundy are displayed within a vase against an abstract blue background. The artist works with broad, expressive strokes of the paintbrush. Titled Série Flores IV in Portuguese. You can find 'flower Series IV' by Dallier in paintings categories such as Still Life Paintings, Floral Paintings, Impressionist Paintings, Expressionist Paintings and Oil Paint Paintings. Enjoy exploring these sections for other Novica treasures.